Known as the enhanced version of T-72B3, the latest modernized version of Russia’s main battle tank, the T-72, T-72B3M was first unveiled to the public during the finals of the International Russian Army Tank Biathlon competition held in October 2014. Designed with a much lower cost in mind, the T-72B3M capabilities will be similar to a more advanced tank, the T-90, according to the Russian military engineers. In an announcement made by the Uralvagonzavod Deputy Director, Alexey Zharich, Russia has plans to upgrade their existing 150 T-72B main battle tanks to the advanced B3M version and they will spend a total of 2.5 million Russian Rubles or USD 37 million to perform the upgrade. This was done by signing the Uralvagonzavod contract and based on some reports, Russia does not plan to purchase any new tanks until 2015. With the driver’s position located at the front and power pack at the back while fighting is done at the centre of the tank, T-72B3M has the same layout when compared to the standard T-72. As for its crew capacity, the tank can fit a crew of three including a driver in the front seat and two additional crew members in the turret, with the gunner on the left side and the commander on the right side. In order to replace the previous Kontrakt-5 system and to increase the protection of the tank by double, the T-72B3M is covered by a new kind of Relikt explosive reactive armour that make use of an entire new composite of explosives to attain dynamics protection. In contrast to the Kontrakt-5, the new material works well against missiles fired from both low and high velocities while doubling its effectiveness against shaped charges and 50% more effective against anti-tank guided missiles. Fitted with large explosive reactive armours (ERA), the side skirts look like the T-90 style and two light steel stowage boxes can be seen equipped on the turret, with one located at the back and one more located slightly behind of commander’s position. By installing the latest V-92S2F engine to T-72B3M on the left side of the hull with a T-90 style exhaust box, the previous 780-hp diesel engine is no longer needed and the new engine can deliver 1130 horsepower. Assisted by an automatic transmission system and improvements made on the drivetrain, the mobility of the tank also becomes better overall. The maximum speed on the road is 60 km/h with a maximum range of 550 kilometres. It has a maximum fording depth of 5m with snorkel kit and it can ford as deep as 1.8 metres. Each side of the torsion suspension bar has six road wheels with the idler at the front, a drive sprocket at the back and three returns rollers to support the inside of the track. Shock-absorbers are equipped first, followed by the first, second and sixth road wheel stations. The top parts of the suspensions are also protected by rubber skirts. Besides the standard equipment including snorkels for deep fording operations, an overpressure-type NBC protection system, and night vision equipment for the three crew members, one of the new primary features that is noticeable on the T-72B3M is the tank commander’s independent panoramic sight, with its own thermal imaging device. The new feature is fitted on the turret’s top centre and between the two hatches. To help the tank commander to monitor the battlefield better, to provide the targets to the gunner, and to direct the turret, the fully stabilized sight has a day channel, laser range finder installed into it. On the other hand, the gunner is equipped with the Sosna-U sighting system, a multi-channel thermal imaging gunner sight with second-generation thermal imaging camera that has 8-12 microns features, and 1A40-4 fire-control system. Sosna-U sighting system includes a day and thermal sight, the ability to launch Anti-Tank Guided Missile (ATGM), a laser range finger, and a channel for missile guidance that can detect targets from a maximum distance of 5 km. 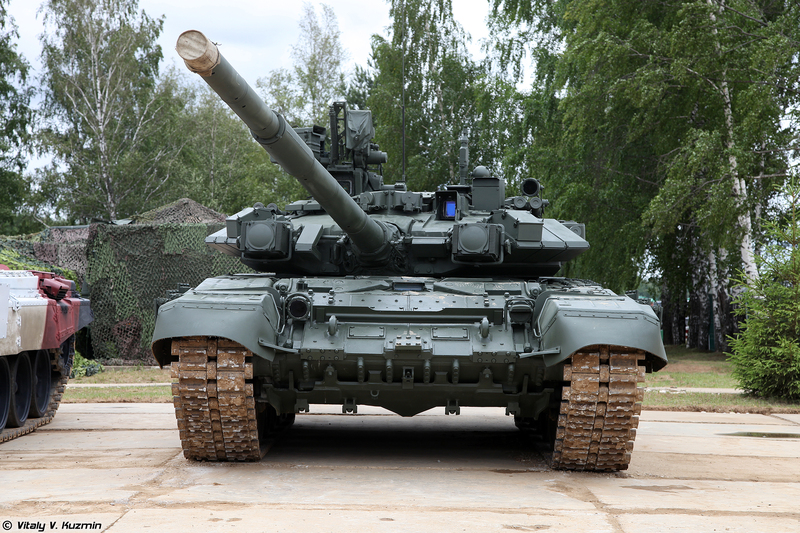 To achieve an increase in accuracy, the T-72B3M is installed with a new ballistic computer and it is also equipped with R-168-25UE-2 radio systems, to send and receive encrypted transmissions on digital voice and data transfer. A dozer blade to be used for removing obstacles and preparing fire can also be seen under the tank’s nose and a snorkel can be seen on the back of the turret. 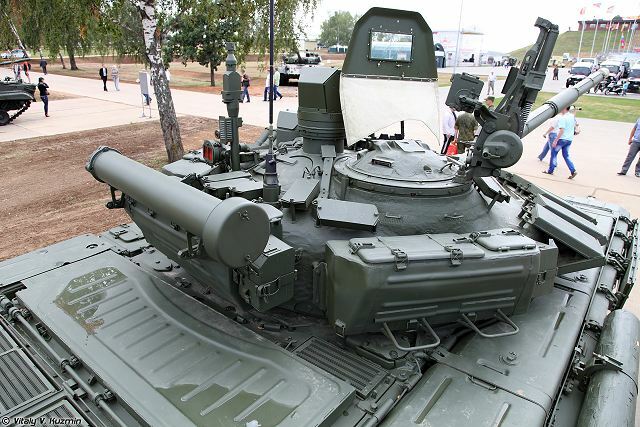 Unlike T-72 series MBT where the unditching beam fitted to the tank’s rear, the T-72B3M version has its unditching beam fitted to the right side of the tank’s rear.